This is a 3-channel Color Organ with built-in microphone and line input. It is an excellent item for parties, school dances and other events and creates an amazing lighting effect in sync with music. This new version is based on three sharp independent active band pass filters using two Quad Op-Amp Integrated Circuits. 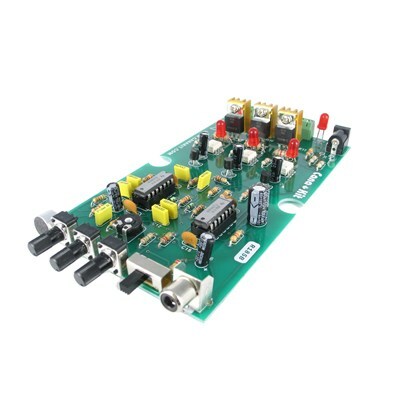 In addition, it incorporates three opto-isolators to fully isolate the four AC output channels from the control circuitry for additional safety. Three independent controls vary the response sensitivity for low, midrange and high frequencies. Three LED indicators also show the status of each channel at any given time. In addition, a built-in microphone is incorporated that allows the circuit to capture the ambient sound and to operate without requiring a direct connection to your stereo system. An audio pre-amplifier circuit is also incorporated so that it can be directly connected to the Line-Out of your audio system. The circuit can handle up to a maximum of 2A of lights per channel.